Healthy Cheri – It's not where you Start, it's where you Finish! It's not where you Start, it's where you Finish! Hi, I’m Cheri. I’m a 40 something year old IT Project Manager/Technical Writer, who lives in sunny Silicon Valley. I see myself as an optimistic over-eater, who continually strives to live a healthy and happy life. HealthyCheri.com is my storyboard of the successes and failures along my journey to a healthier me. I love good food, gardening, writing, cooking, dancing and hiking. Please feel free to browse around the site and hopefully you’ll find some ideas, recipes and motivation! In my late twenties I remember telling myself I’d never go above 130 lbs. Fast forward about twenty years and I officially went over and above my original weight goal of 130 lbs. Let’s just say I was “slightly” over my ideal weight by almost 100 lbs. Over the last ten years I’ve attempted to step back on the weight loss bandwagon, but my efforts continued to be fleeting and short-lived. A quick browse through my old Natural Weight Loss Show Blog will attest to my lack of commitment. So flash forward to exactly one year ago (August 15, 2015)… I turned another year older and was feeling overwhelmed with personal and work related stresses. I was managing my stress by eating and drinking to excess and it was showing, not only on the scale, but in every movement I made. After celebrating my birthday in late July and my dad’s 70th birthday a week later, I was ready to pull the trigger and do whatever it took to get healthy and lose weight. 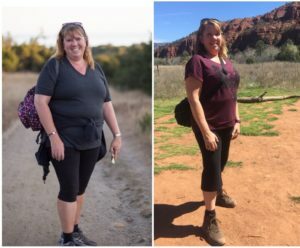 I enlisted the help of a nutritionist (Vesna Mardesic), who I met through a nutrition seminar at my gym (AVAC), to help support and encourage me to finally lose the weight and keep it off for good. I’ve had a few ups and down since I began this journey a year ago, but to date I lost a total of 50 lbs. and my goal is to lose a total of 100 lbs. I believe blogging to a public forum is a great incentive to help me keep on track and also a good way to store recipes and reference materials. I look forward to collaborating, sharing ideas and building a community so we can help each other to achieve our weight loss/fitness goals. Why did I start this journey?